ASDIP CONCRETE includes the design of concrete columns. This structural engineering software is based on the latest ACI 318 provisions. This article is an overview of the structural design of concrete columns subjected to concentrated loads and moments. Columns are structural compression members which transmit loads from the upper floors to the lower levels and then to the soil through the foundations. Since columns are supporting elements, failure of one column in a critical location can cause the progressive collapse of adjoining floors. Normally columns are subjected to combined bending and axial load. These moments are generally due to unbalanced floor loads, eccentric loads such as a crane, lateral loading such as wind or earthquake, etc. How do you calculate the column strength? Failure in concrete columns may occur either as a result of material failure or by loss of lateral structural stability. 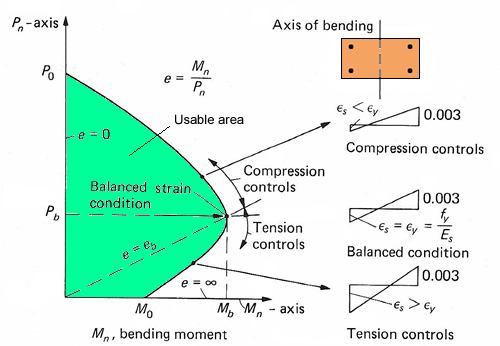 When the strength depends only on the section properties, it is classified as a short column, as opposed to the slender column whose capacity is affected by the secondary moments due to buckling. It’s easier to visualize the behavior of a short column first, and then analyze the slenderness effects. The capacity of reinforced concrete sections to resist combined axial and bending loads can be expressed by a Pn-Mn interaction diagram, where each point of the curve represents one combination of the nominal strengths corresponding to a particular neutral axis location. Each point is calculated as follows: based on the maximum compressive strain (0.003 per ACI) and the location of the neutral axis, find the strain at each level of reinforcement and then calculate the compression block and the stress at the rebars. Finally, the axial force Pn is computed by summing the concrete and steel forces, and the moment Mn is computed by summing the moments of these forces about the centroid of the cross section. This procedure is followed with multiple locations of the neutral axis until the interaction diagram is constructed, as shown below. ASDIP CONCRETE generates the interaction diagram of either a rectangular or circular column. The software uses either the actual parabolic concrete strength curve, or the Whitney simplified block. This rectangular block, although simpler, is not correctly applicable to non-rectangular compression areas, since the centroids of the actual and idealized blocks do not coincide. How is the column strength affected by its slenderness? The column slenderness is defined in terms of its slenderness ratio kLu/r, where the term kLu is called the effective length and the factor k modifies the actual column length to account for end restraints other than pinned. The value of the effective length factor k varies between 0.5 and 2.0, depending of the buckled shape of the column for different end conditions. The parameter r is the radius of gyration of the cross section. In practice, columns are rarely found as isolated members, but they are part of rigid frames together with other structural members such as beams. When the frame is laterally braced, the joint translation is prevented by shear walls, attachment to adjoining structures, etc, and such a column is called Non-sway, as opposed to a Sway column, where the lateral stability is dependent of the stiffness of the members of the frame. When a slender column is axially loaded, it tends to buckle, which creates a deflection Δ. This deflection times the axial load produces an additional (secondary) moment, which in turn increases the deflection, which in turn increases the moment, and so on until the system converges. This is called a P-Δ analysis. A material failure will result when a particular combination of load P and moment P(e+Δ) intersects the interaction diagram, as shown in the figure below. Note that the additional moment actually reduces the axial capacity of the column. How are the second-order effects accounted for? Elastic second-order analysis. The secondary moments are calculated iteratively during the analysis of the frame by a general-purpose analysis software with this capability, considering the presence of cracked regions along the member. This is the most rational method and the resulting moments do not require any further modification. Moment magnification procedure. The moments obtained from a first-order analysis are multiplied by a magnification factor to account for the second-order effects. This is an approximate method performed during the design of the member. The moment magnification method is different for sway and non-sway columns. For braced columns, the magnified moment is Mc = δns M2, where δns is the magnifier and M2 is the maximum moment at the column. The factor δns = Cm / (1 – Pu/0.75Pc), where the critical load Pc considers the stiffness EI of the column. For sway columns, the magnified moment Mc = M2ns + δs M2s, where M2ns and M2s are the maximum moments due to non-sway and sway loads respectively. The magnifier δs = 1 / (1 – Q), where the stability index Q = ∑PuΔo / (VusLc). When δs > 1.5 then Mc should be calculated using δs = 1 / (1 – ∑Pu/0.75∑Pc). ASDIP CONCRETE calculates the magnified moments for each load combination of either a sway or non-sway column. When a column has moments about the two axes, it’s necessary to generate a biaxial interaction diagram. To do so, the cross section is rotated multiple times about its centroid, and the uniaxial diagram described above is generated at each new rotation. The end result is a 3D interaction diagram. To check the adequacy of the design, the actual factored and magnified loads should be compared to the structural strength of the column, as described by the interaction diagram. 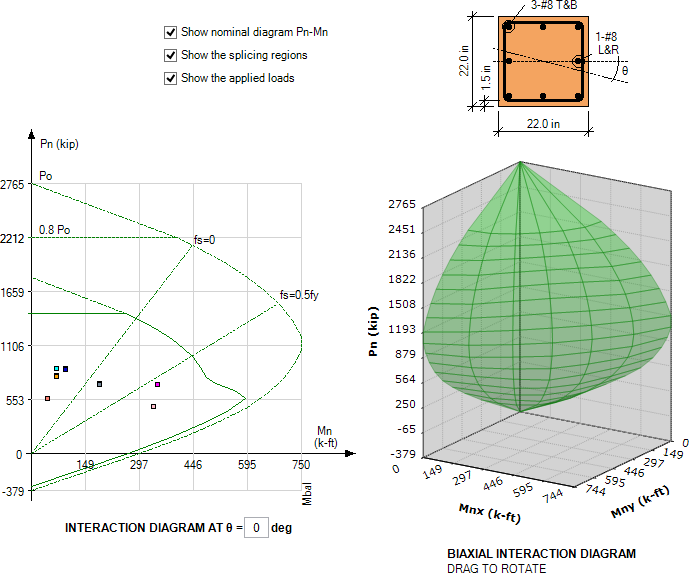 The images below show the uniaxial and biaxial interaction diagrams generated by ASDIP CONCRETE. Detailed information is available about this structural engineering software by visiting ASDIP CONCRETE. You are invited to download a Free 15-Day Software Trial or go ahead and Place Your Order. Pl guide me regarding this software .. how can I get it ??? Please go ahead and download ASDIP Foundation and check if it suits your needs. Why ASDIP CONCERT NOT USE ACI318-2014?? The difference between ACI 318-11 and 14 is mostly about formatting. In ASDIP Concrete we will update the references to the code in the Detailed tab and report. Other than that it complies with ACI 318-14. Are you having the same for Indian codes & if yes can you let me know how you are dealing with biaxial momenets. How you are deciding the angle of rotation of column based on the moments. The software is based on the american standards: ACI, AISC, ASCE 7, IBC. At this moment the Indian code has not been implemented. The tangent of the angle of rotation is the ratio of both uniaxial moments Mx and My. Hello, is there a 3D interaction diagram formulation algorithm or the internal process shown to the users for verification? The 3D interaction diagram is generated by the software by rotating the cross section multiple times. The 2D interaction diagram is then generated at each new rotation angle. The process is extremely long and cumbersome to be done by hand. From the figures, it seems the computed biaxial diagram is for one constant theta angle. Is this right? Should not to be for a constant angle = atan(Mx/My)? Yes, the 2D diagram is a plane cut from the 3D diagram at an angle Atan(Mx/My). However you can generate the 2D diagram at any other angle that you wish.